We’re excited to share with you our press release which officially went out today! It’s been great to have such a wide variety of players partake in our game and give such great feedback! December 17, 2018 – Nassau – A worldwide phenomenon has reached the Bahamas, with a local husbandand wife opening the Bahamas’ first escape room experience. The idea was the brainchild of Lee and Chrystonia McCoy, who have done many escape rooms around the world. The pair developed the idea for the better part of a year, and attended the international Room Escape Conference in July. This motivated them to finalize the design and business aspects of the room, and the game started testing in September and officially opened for business in October. To date there has been a mix of participants playing the room. 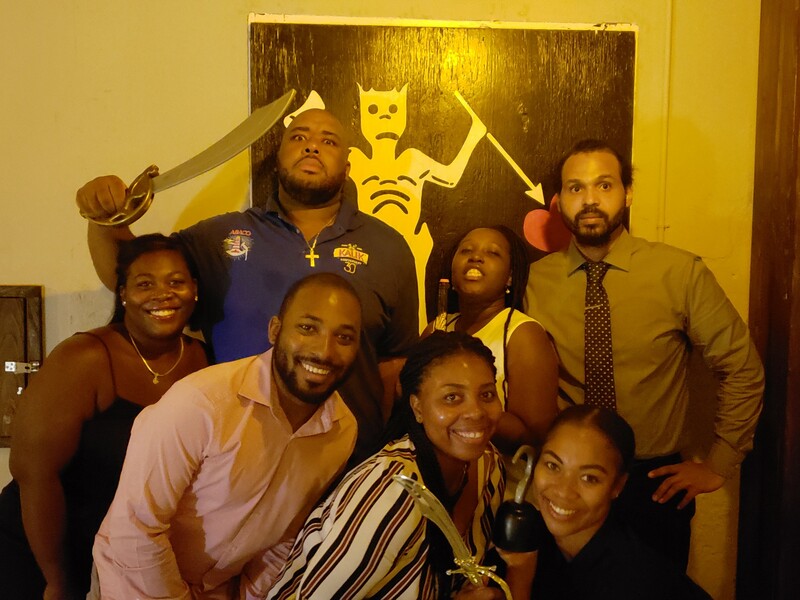 Many local Bahamian players have taken part in their first ever escape room, while some have done games in other countries. 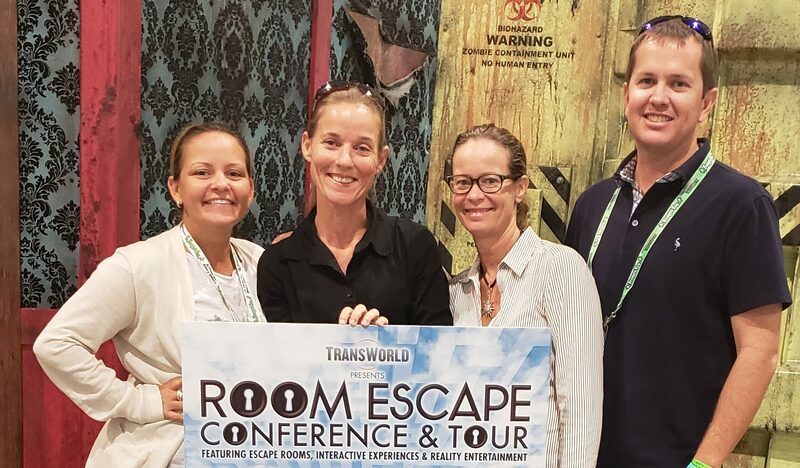 There have also been tourists playing the room, from large family groups to experienced enthusiasts who sought an escape room in the Bahamas. The overall response has been extremely positive, with great reviews on Facebook and TripAdvisor. 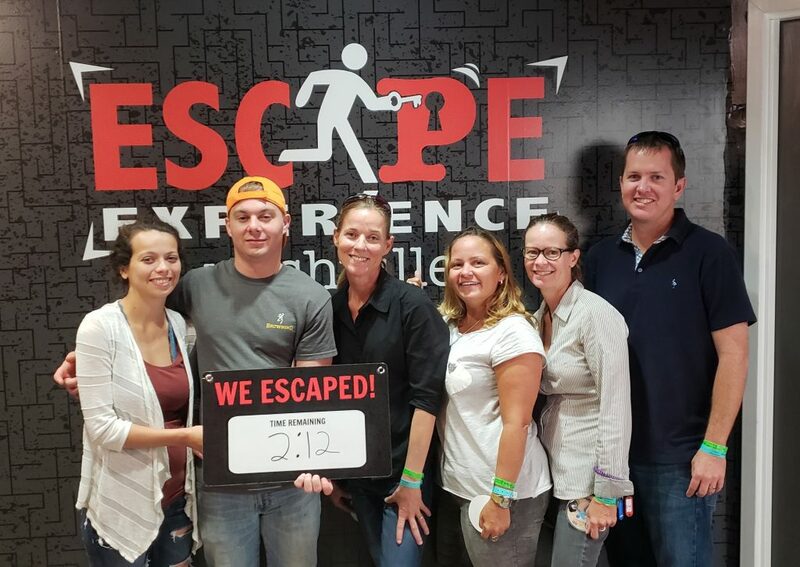 For those who don’t know what an escape room is, the concept is simple – a group of people are placed in a room, and they have a set time limit to “escape” by finding clues, solving riddles, and completing puzzles. The challenge is in working together to complete all the tasks in the set time limit. The experience is akin to going to the movies, except it’s an interactive game in which you becoming immersed in the scenario. The room is designed for beginners and advanced players. The fastest time to escape has been 27 minutes, while many groups have not escaped and were fictitiously caught by the British soldiers. During the game, the “game master” is watching and each team gets three hints to help them along the way. Some groups have escaped with no hints while others require more than three – it’s up to the game master to keep the gameplay flowing. Many escape rooms use technology to augment the puzzles and clues, but a purposely chosen low-tech room was created. “We wanted to tie into the time period authentically – it adds to the immersion and makes people feel like they are trapped in a pirates hideout” explains McCoy. “There were no blacklights in the 1700’s, so we don’t have any in our room”. Pricing for the experience starts at $30 per person or groups can book a private room for up to 8 persons for $199. Gift certificates are available for purchase. Guests can get more information and book online at their website blackbeardsescape.com or call 242-813-3222 for reservations. For more information, or to schedule a media experience, please contact Chrystonia McCoy at email@blackbeardsescape.com or 242-813-3222. Looking for that perfect holiday present? Give the gift of a live escape room experience! Purchase individual tickets or a private room experience, perfect for friends & family! To purchase gifts for different persons, please book each separately or contact us for further options! If you’d like to purchase a gift with cash, please email us for further details. We love our reviews! Whether they’re on Facebook or TripAdvisor, it always puts a smile on our face to read them! We had some experienced Escape Room enthusiasts stop by recently, and they gave us a quite thorough review we’re proud to share with you! The steaming streets of Nassau juke and swerve. The aroma of roasted meat and exotic spices dance on the tropical breeze like a sensuous spirit, luring tourists to pastel colored delights. Soon enough the intrepid traveler finds one’s self in a sun-kissed courtyard. Statues that look like Disney rejects from their classic Pirates of the Caribbean ride stand motionless among the palm trees and cracked stone benches as escape room enthusiasts eagerly await their chance to take a crack at helping the infamous pirate, Blackbeard, escape the Royal Navy with booty intact. Immersion is an important aspect of escape rooms, and one can’t overstate the impact of treading the same winding byways down which brigands of yesteryear may have drunkenly stumbled. A whiff of rum and salt on the air fills the adventurous mind with images of peg-legs and eye patches, cannonballs and black spots. 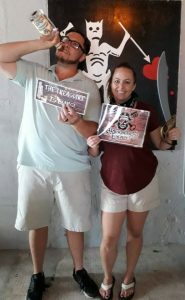 Thus one enters the world of Blackbeard’s Escape, Nassau’s first room escape challenge. As is always the case with escape rooms, you are locked in a room. You’ve an hour to accomplish a task and find your way out the door. 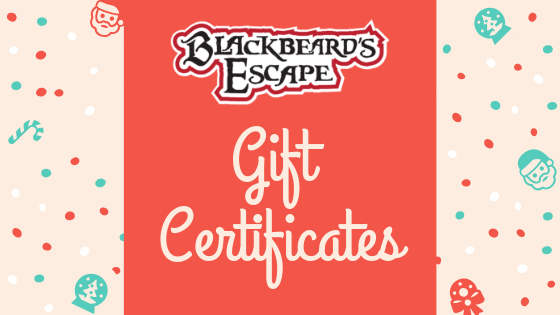 In this case, Blackbeard has already fled the room in which he’s been holed up, and he’s hired you to get in, grab his treasure, and get out before the Royal Navy help you learn how to dance on the wind. 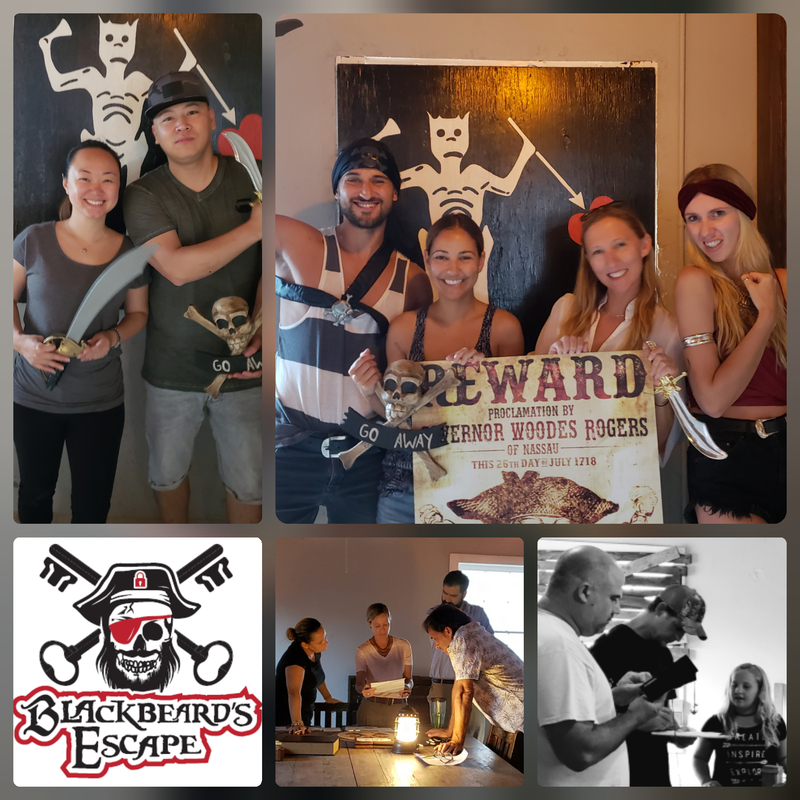 Connected to the Pirate’s of Nassau Museum in the heart of Nassau’s tourism district, Blackbeard’s escape seeks to bring immersive puzzle solving fun to the bustling haven of pirates of yore. At the time my wife and I visited, they did only have the one room, with promises of more to come in the future, but if future additions meet the quality of their first room, regular visitors to the Bahamian city can rejoice! Blackbeard’s Escape is an excellent experience for beginners. Seasoned veterans of escape rooms might find that this one veers towards the easy side of the spectrum but not frustratingly so. You are allowed three clues, and my wife and I used only one (that, after we received it we were slapping our foreheads so hard we were in risk of leaving permanent marks). Aside from what ended up being silly oversight on our part, we were able to solve most of the other puzzles in the room in the first half hour. That’s not to say that easy can’t be entertaining, nor does it fail to be original. The puzzles were an absolute blast to solve with a few things I’ve not seen before. It was clear that this was a room put together by people who had a passion for escape room puzzles. Further, while this is a classic lock and key (or gen 1 for those that are really committed to industry jargon) mechanics, this has also ended up being one of the most interactive rooms we’ve played in where virtually everything is part of something else, and nearly every single item in the room is a vital part of the game. For such a low tech room, we truly came away feeling as though this was one of the more immersive rooms we’ve experienced yet. Yes, you’re in the caribbean. Yes, street sounds are artfully pumped into the room to near perfection. But also care was placed into the story, one that evolves as you solve one puzzle after the next. There’s even a plot twist or two that manifest late in the game which is something I’ve not seen done before and I felt deserved special praise. If I were to provide any criticism at all to this room it would be sparingly. Perhaps hiring someone to dress up in authentic garb to deliver a scripted introduction might have taken the immersion level, already laudable, and really elevated it to something special. Also, while this room is great for beginners, one does get the sense that if Blackbeard’s Escape is going to attract the greater escape room crowd, future rooms will need to be more challenging. All of that said, this was a truly enjoyable escape room for us. Yes, the pirate theme is a pretty common trope in escape rooms, but this is the Bahamas! If ever there was a place where a pirate themed escape room belonged, this is it! A great, immersive room, friendly staff, and well designed (if easier) puzzles are complemented by an unusually intricate story making this room a must for those that find themselves in Nassau. We have had a great time beta testing our escape room! We had some local Bahamian friends and family out to test from the very beginning, and even had enthusiasts from New York visit and give us some great advice! We have added additional puzzles to lengthen the game and changed a few of the clues to sharpen the game play. We are now taking bookings on select days as well as are open for group bookings!